Indonesia has been hit by natural disasters, such as the 1883 Krakatau eruption and the 2004 Aceh tsunami. How are these evoked in Indonesian literature and what do they tell us about society? 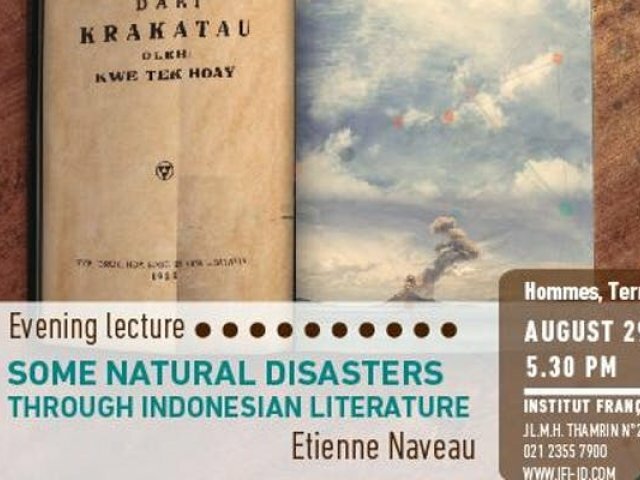 Etienne Naveau will give some answers by analyzing the novels of two prolific authors: Kwee Tek Hoay and Taufiq Ismail. The first, interested in Theosophy, wrote The Drama of Krakatau (1929). This novel took Bulwer-Lytton's Last days of Pompeii as his literary source, and took into account a very precise scientific documentation of the event. This sentimental drama portrays a character of a wiseman Baduy, heir to the Hindu kingdom of Padjajaran who retained his old religion in worshipping the protecting god Vishnu. In so doing, this novelist reflects on cultural and religious changes which, even more than natural disasters, could have traumatized the Archipelago. Quite different is the approach of Taufiq Ismail, which, according to Muslim theodicy, is thinking about the human fate and the meaning of suffering. Holder of an “agrégation” and a PHD in philosophy, Étienne Naveau received too a doctorate in Indonesian language, literature and civilization from the Inalco (the National Institute for Oriental Languages ​​and Civilizations). The subjec”t of his doctorate is “Indonesian autobiographical texts”. Since 2003, Étienne Naveau has been lecturer in Indonesian language and literature at Inalco and a member of Cerlom (Center for Studies and Research on World Literatures and Orality). In November 2017, he attended his HDR with the title "Indonesian Identities and Foundational Discourses (Literature, Philosophy, Religions)".